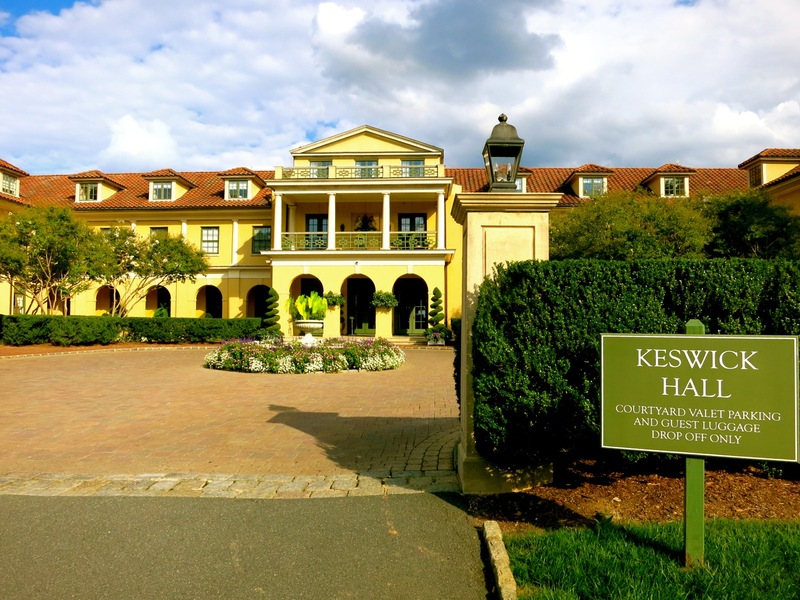 ** Keswick Hall is currently closed for renovations in 2018 and according to the website, will reopen in 2019. Read below for 2014 review and photos…. 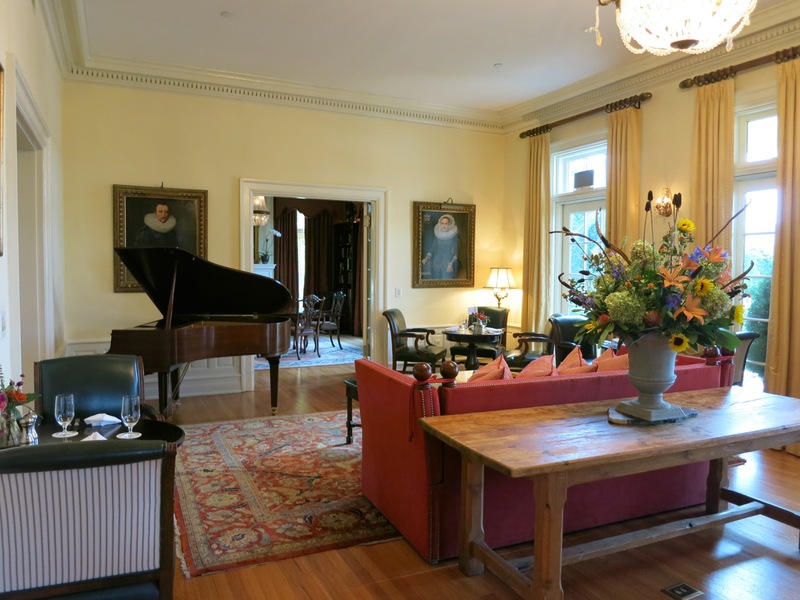 One of the most stunning and exclusive resorts in Charlottesville if not the whole state of Virginia, Keswick Hall casts a spell as you drive through the gate, past manicured and flowering lawns, to what appears to be an Italianate villa. With golf. It’s a sanctuary in and of itself and a self-contained destination. Built in 1912 as a private residence for Robert Crawford and his wife, Villa Crawford, as the inn is now called, was opened as a hotel in 1993. On 600 acres, The Keswick Hall Resort encompasses the guest rooms at Villa Crawford, the Keswick Club – where the Golf Pro Shop, Fitness Center, Palmer Room Restaurant, and Spa are located, a Chef’s Garden, and the Tennis & Aquatic Center with your choice of Hard Surface, Har-Tru and Clay Tennis Courts and of course, the famous Pete Dye 18 Hole Golf Course, There’s a constant roster of available indoor and outdoor activities including Audubon-certifed Bird Watching, Bocce Ball, Nature Walks, Yoga, Wine and Beer Tasting – a true recreational camp for all. The University of Virginia and Monticello are nearby, but even if you are not touring the school or Tom Jefferson’s place, and especially if you are a golfer, I’d recommend that you stay on site for the ultimate gentrified escape: play golf on the newly designed Pete Dye course, Full Cry – just named One of The Best New Golf Courses in 2014 by Golf Digest, followed by drinks and billiards in the study, dinner overlooking the grounds, and an early night in one of 48 guest-rooms so you can get up at the crack of dawn for another round. Walk through the grand front door into an inviting living room lobby, with affable, earnest receptionists at antique desks ready to check you in. You’ll sit down and begin a dialog. 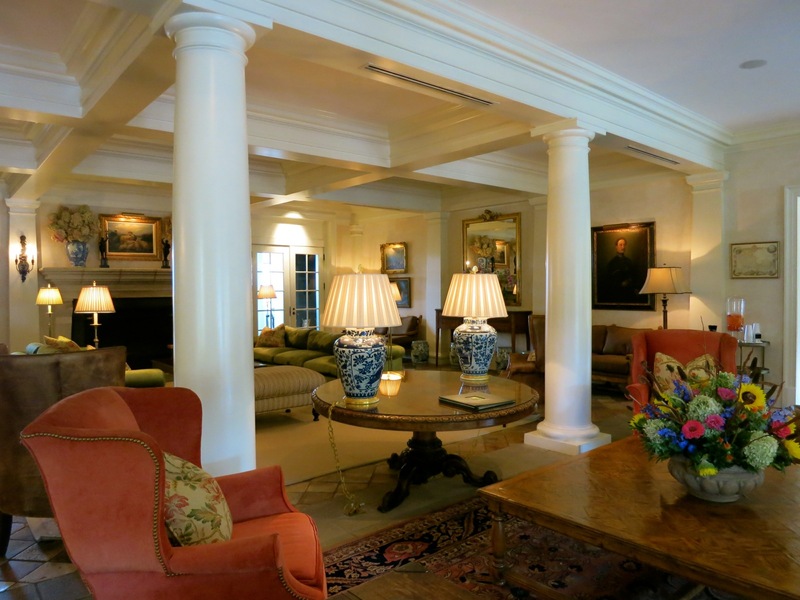 It’s personal and serene: more like a conversation with your own private concierge, so it’s no wonder that repeat visitors feel so at home here. Amble down to the billiards room where you might find a game in progress, or sit in the library for a drink. 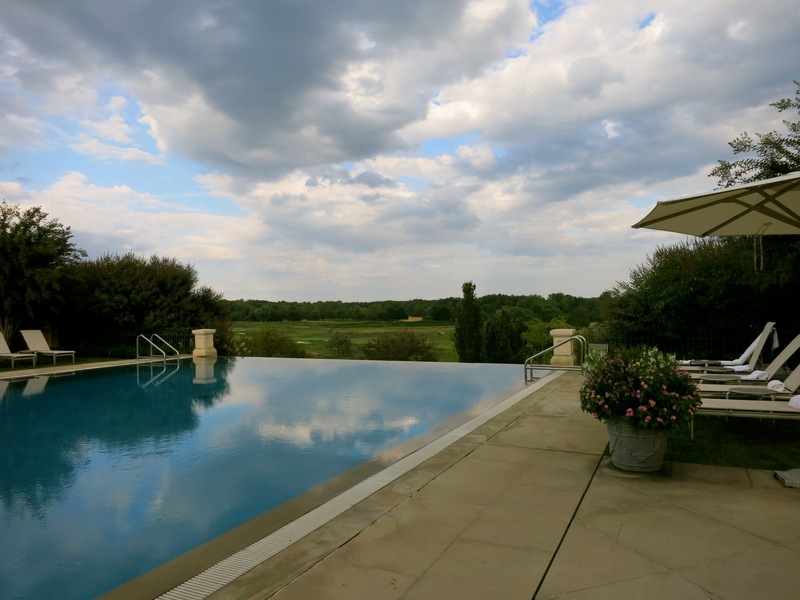 Out the door, you’ll find one of the most enchanting infinity pools on the planet – a rectangle of crystal blue with one edge disappearing into the golf course and the Blue Ridge hills beyond. Rooms vary in size, but all appear to be awaiting Thomas Jefferson’s arrival. Gone is the fussy Laura Ashley wallpaper (her widower bought and transformed the villa into a resort in 1993). Now, with light neutral colors, carved four-poster beds, sitting areas, wall-to-wall carpeting, and bright, gleaming bathrooms, guestrooms manage to be romantic and presidential at the same time. 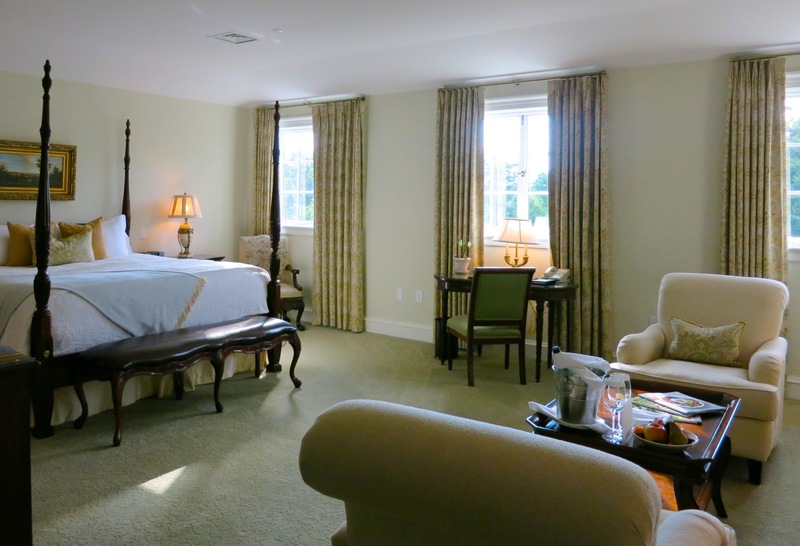 Many celebrities, such as Mick Jagger, Jessica Lange, Anthony Hopkins and others have stayed here, only one couple – Paul Newman and Joanne Woodward – had a favorite room. They preferred the original master – Room # 9. 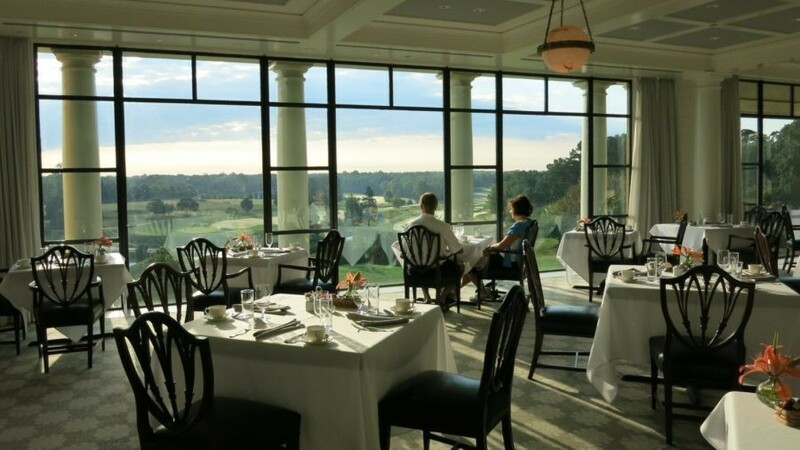 Plan to have at least one meal at Fossett’s – the in-house restaurant overlooking the exquisite golf course. And yes, cuisine lives up to the view. 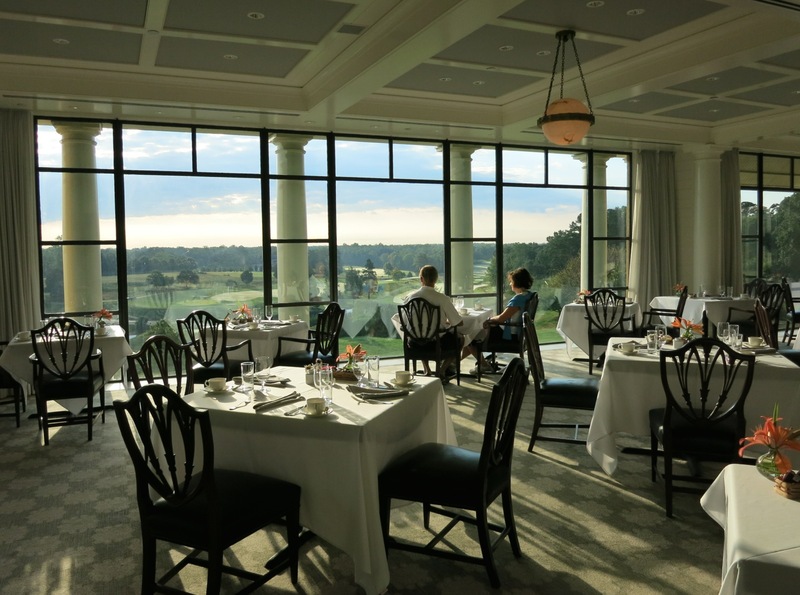 Fossett’s was named for Edith Fossett, Thomas Jefferson’s head cook at Monticello, who was trained under a French Chef, and, like the current restaurant, utilized local fish, game produce and cheese as her signature style. Or, dine a bit more casually in the clubby bar. You can order from either the pub or fine dining menu. I was told by a long-term club member to order the Monrovia Farm Burger ($15): “you won’t be disappointed.” I wasn’t – it was satisfying as all get out and just may tempt vegetarians to rethink their food choices. The Fig/Prosciutto/Goat Cheese Salad warrants seconds, and the signature “comfort food” 40-Clove Chicken Breast ($28) is as toothsome as it gets. 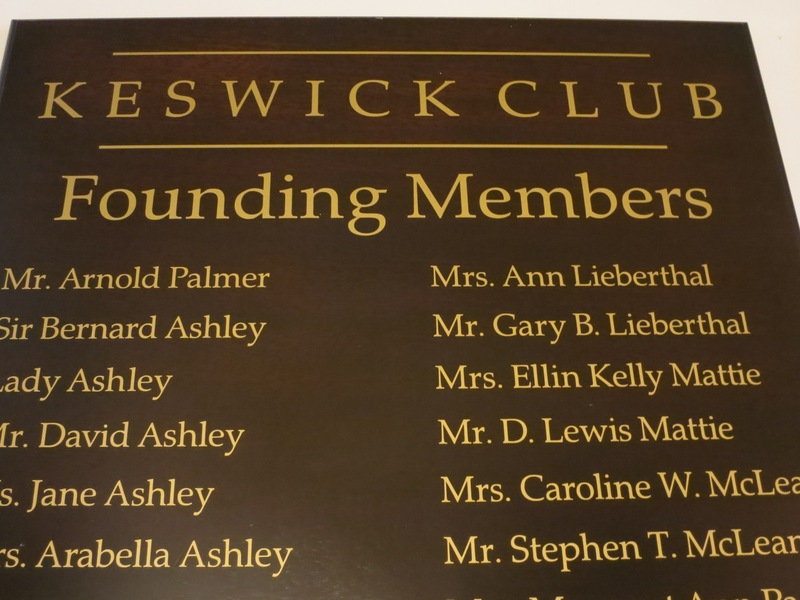 Golf great, Arnold Palmer, was among the founding members of the Keswick Golf Club, so the sport has been serious business here since day one. Palmer re-designed the resort’s course in the ’90’s, but in 2014, Pete Dye completely modernized it to much approval. But you need not pay big bucks to join in order to hit the links, work out in an expansive fitness center or catch a game on one of the TV’s at the club’s bar. All you have to do is check in to the resort. 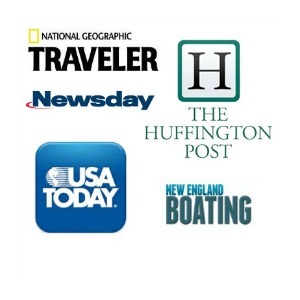 Room rates from $170 to $930 depending on size and season. The Hunt package begins at $409 (single occupancy) and features 18 holes upon arrival, one-night of lodging (superior room), and breakfast and an additional round on Full Cry the next morning. Add a guest for $130.